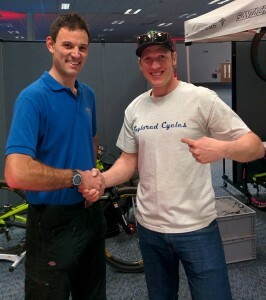 Steve showing off one of our Taylored Cycles t-shirts. 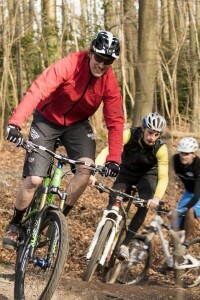 This weekend Steve Peat came to Bristol. He was mainly in town for Peaty’s Bike Bonanza on Sunday. But he also came for a ride with a big group of locals around Ashton Court and Leigh Woods on Saturday before a evening at the Arnolfini for “An evening with – This is Peaty”. Spot the Taylored Cycles logo in the background. Photo by Kerry Rice. The ride on the local Bristol trails was great. The sun came out and with the trails dry from a rain free week it felt like summer! I don’t think that I will ever again ride trails that I know so well in a single file of 90 riders one of which is a past world champion. Everyone enjoyed the ride and we all went at a pretty chilled out pace with all egos left behind in the cafe. 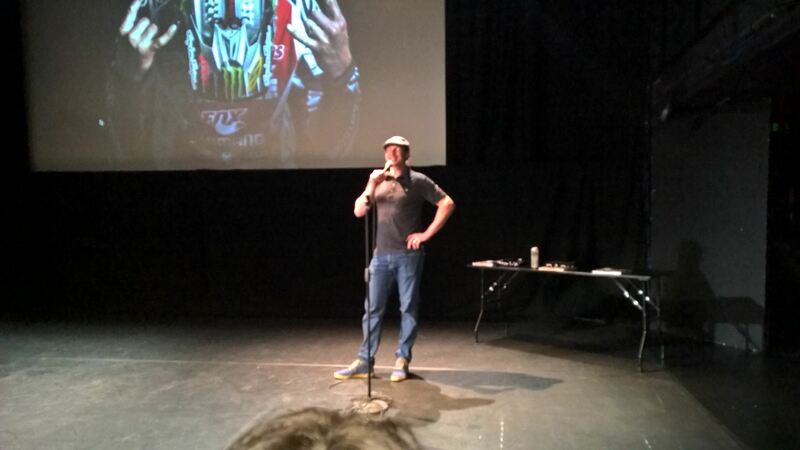 The evening event consisted of an hour long film put together from recent This Is Peaty episodes with some previously unseen footage, then a Peaty themed quiz followed by a Q&A ask Peaty anything session. It was great to meet the man, the legend and find out lots more about him. He spoke about his career, his team and the highs and lows including his life changing crash at the 2004 World Championships in Les Gets. It seems like it effected him very deeply. After the Q&A he came and had a couple of pints with everyone in the bar. He is a really nice bloke, really approachable and friendly. 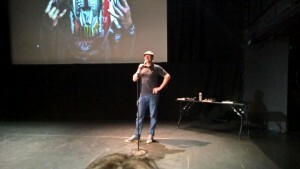 Steve answering questions at The Arnolfini. Photograph by Hwe Pang. At the Bike Bonanza there were bargains galore. Everything from Steve’s own bikes, ENVE wheels and riding clothing to titanium hardtail frames to last year’s Fox forks brand new from Mojo to all the stuff that the local biking community had in their sheds. It was a brilliant event, lots of people went away very happy to have sold on their spare kit and to have got a great deal on some second hand parts. Fingers crossed that Steve decides to come back and do it all again next year! ⟵The Taylored Cycle Hub is at Southmead Hospital today!